I can’t believe it, the end of fall semester is in sight. I give my last few lectures this week, and I finish up finals shortly after that. Wow. Where did this semester go? One of the benefits of professor life is that we often get a long winter break. It provides a great time to prepare for the coming semester, and also to work on neglected research. Well… that’s the idea anyway. And in all fairness, I begin each break with that very intention. I dream up all of the productive things I’ll accomplish; I’ll write my lectures for the following semester, I’ll finish my book, I’ll complete research on a new article, etc. Unfortunately, more often than not, the days fly by too quickly. All of a sudden it’s January, and I’ve accomplished maybe a quarter of my list. Have you ever experienced this? It’s so discouraging. With this year’s break coming up fast, I decided to be proactive. I’m determined to make the most of my time, so I knew I needed a plan. 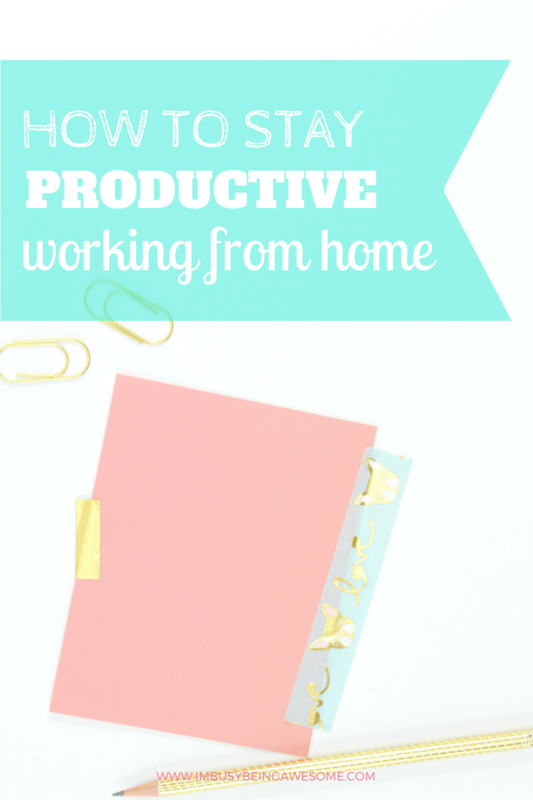 Over the past few weeks, I’ve researched how to stay productive working from home, which is one of my biggest challenges. You see, during winter break, I tend to work from my home office. It saves on commute time and gas. Plus, it’s just so much easier than schlepping into work each day – especially in the winter. Needless to say, this is incredibly frustrating. 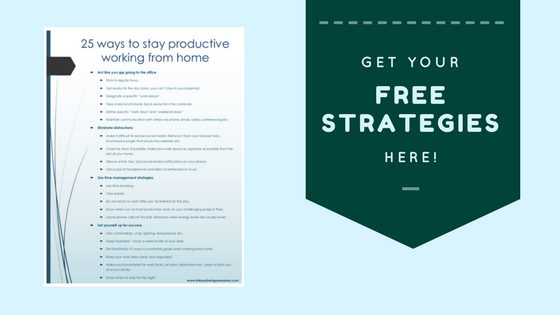 Fortunately, I’ve created a list of 25 effective strategies to stay productive working from home. 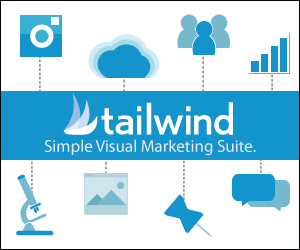 They are easy to implement, and you’ll see results immediately. 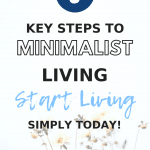 So if you struggle to stay focused working in your home, or you’re simply looking to get more done each day, read on. I share 5 of my favorite strategies here. 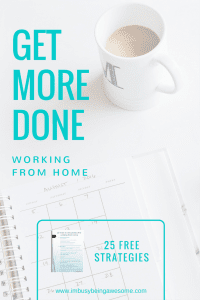 And if you’re looking for more great tips, you can click here to download my complete list of 25 ways to stay productive working from home. 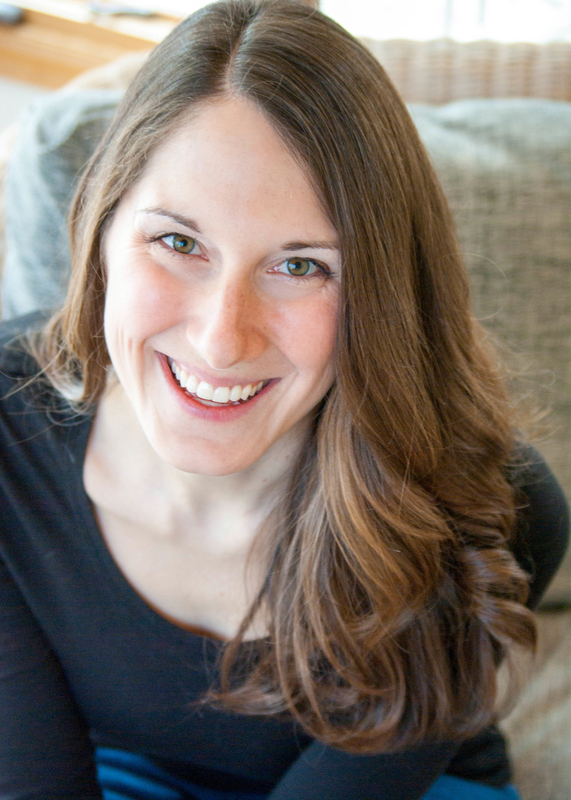 On the flip side, complete flexibility can also be a productivity stumbling block. And this is especially true when it comes to setting your own hours. Why? Because most people thrive on daily routine. Without structured hours in your day, it’s very easy to work too much, which squelches your work-life balance. And alternatively, it’s easy to work too little, which leaves you scrambling to accomplish your work. The easiest fix is to set yourself work hours and stick to them. Of course, this doesn’t mean you have to follow the standard 9-5 structure. If you prefer to section off your day from 6am-8am, 11am-3pm, and again from 7pm-9pm, go for it! If possible, designate a clear “workspace that is separate from the rest of your home. This is important for a couple of reasons. First of all, it helps you maintain work-life balance. One of the biggest challenges of working from home is feeling like you’re always at work. When this happens, we often feel inclined to keep working, because we never really get away. A situation like this is just asking for burn out. And that leads directly into a productivity nosedive. Not an ideal situation. If you can maintain a designated “workspace,” however, you can reinforce that work-life balance. You give your brain time to recharge so you can come back fresh each day. Second of all, select a workspace that is quiet and free from distractions. Sure, lounging on the couch may sound more appealing than sitting at the dining table. But the couch is also where you hang out, watch TV, play games, etc. In other words, sitting on the couch probably doesn’t scream, “get work done!” Choose a place as free from distractions as possible, and get to work! Comfort is also important. If you’re trying to work, but you can’t stop thinking about that pinch in your lower back, the bad lighting in your office, or the fact that you’re freezing cold, your productivity will slide. So set yourself up for success. Purchase a desk chair that provides good back support (this is the one I have). Make sure your lighting is sufficient so you’re not straining your eyes. And ensure that your AC and heating work properly. It may seem superfluous, but these little extras really make a big difference. You’ve set your hours, and you’re sitting comfortably in your office. Now it’s time to focus. I recommend starting with the strategy of time blocking. This will help you efficiently map out your workday and recognize how much time you want to spend on each task. Next, tell yourself you’re ready to work. Literally. So if you find your mind wandering, or you’re distracted by those little sounds, get some headphones for work. Then, put on music or white noise, and focus on the task at hand. If you’ve read my time blocking post, you know I’m a big believer in taking breaks. Working for hours on end, in my humble opinion, can actually be counterproductive. You’ll burn yourself out, and your quality of work suffers as a result. So make sure you allow yourself breaks throughout the day. Get up and stretch, walk to the kitchen for a glass of water, and keep those energy levels up. Remember, it’s a marathon, not a sprint. 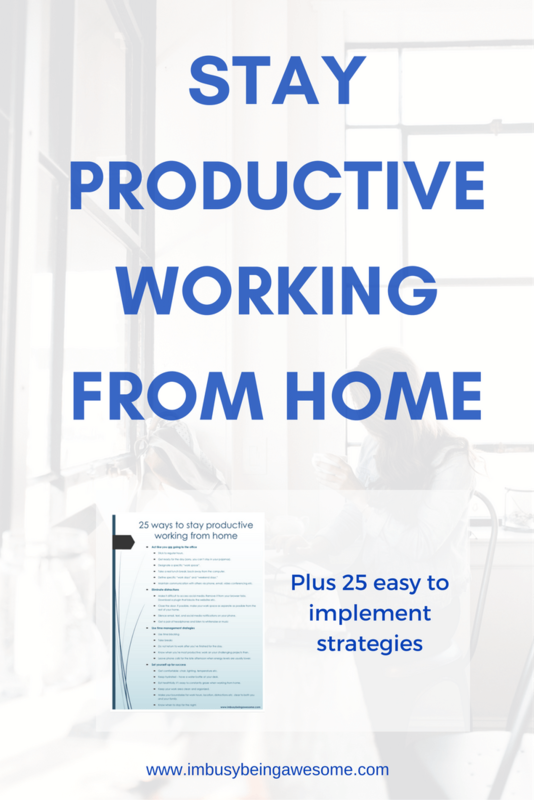 Looking for more great strategies to increase productivity working from home? 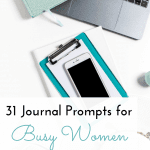 Click here for an entire list of 25! 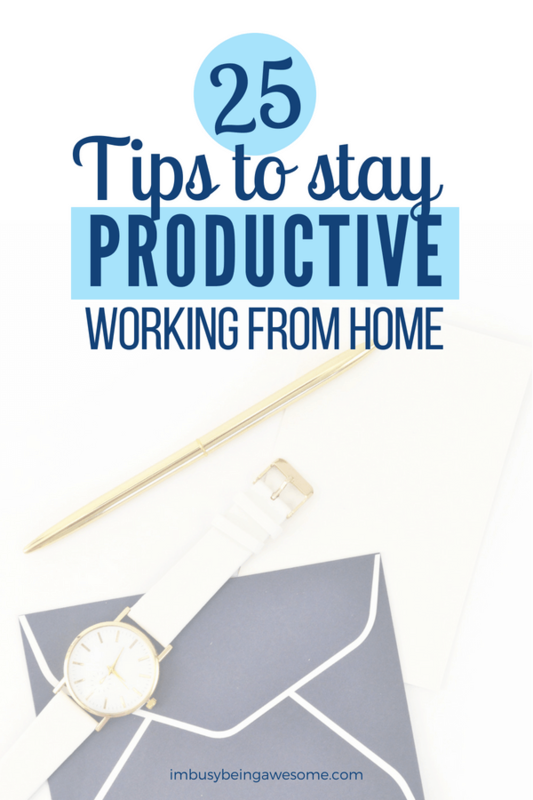 How do you stay productive working from home? Alternatively, how do you stay productive at work? Do you prefer working at home or in an office better? Let me know below! I’ve been blessed with the option to work from home and it definitely comes with its challenges! It’s so easy to get TOO comfortable and completely zone out! I think having your own space is so important! Ever since I started working from home, having my own space has made a huge difference! I agree – it’s amazing how much of a difference it makes. 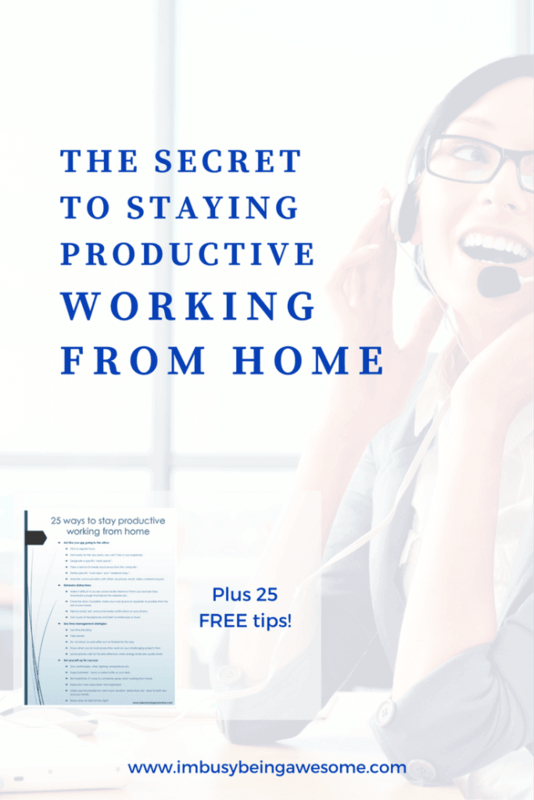 This is so incredibly helpful for those who work from home! I think these points are great! For me, the first two have really helped- setting work hours and creating my own space. If I just sit in my bed to do work on my laptop, I end up getting more distracted by emails and other “non productive” things. If I sit in my desk chair then I focus much better! Yes! I’m the same way. It’s amazing how much an official “space” helps. I still work outside the home (hope to be at home one day), but this tips are applicable to any work environment. Thanks for sharing! Thank you for that post! I think my biggest problem are all the distractions I have at home. I can always find something else to do, but that’s not helping 😉 Having an extra room as my workspace would be really great. I recently started working from home and these tips are really helpful I still struggle with setting up work hours though. thanks for sharing. This is a great list of advice. 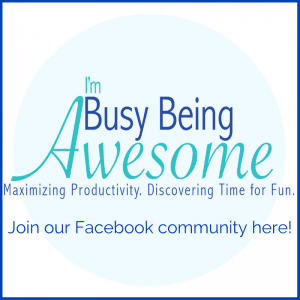 I love all tips on staying productive, thanks for sharing. Love the idea of getting a clear workspace. I used to work in the living room, but ever since I got an office at home I get a lot more done! It’s amazing how much that helps, isn’t it? Setting work hours is something I’ve struggled with but it is definitely VERY important. Thanks for the tips. I am a major list maker! Having something in writing and being able to cross it off helps me be productive. Fantastic tips here. I actually stay VERY productive working from home, but it’s SO important to stick to a to-do list and a schedule. I find that time blocking works. I also recently set up a proper work desk at home which makes a massive difference! Yes! Isn’t it amazing how much a difference a proper work space makes? This really hits home. I struggle a lot with productivity working from home because there is always some sort of house chore or a kitty walking across my keyboard and demanding attention there to distract me and derail my list. Great advice! I hear you! And those other chores always seem more appealing to me that the work 😉 ha! Love these tips. Time blocking really helps with me. I do my focus work in short blocks in the morning taking regular breaks. Really good tips! Often if I get tired when working from home, i will set my timer for 10 minutes for quick nap! Always helps! I love that idea, Keri! Quick cat naps are so helpful. I have such a hard time staying on task when I work from home. I’m definitely more productive at the office. Although part of that is probably because it’s harder to work on just my laptop screen vs. the 2 big screens I have at work. I definitely have to make a list of what I want to get done every day regardless where I’m working. That’s really the only way I get anything done. Crossing items off my list is so satisfying! This is fantastic advice I really needed! 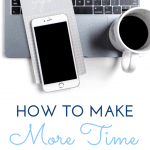 I just started blogging and it Can be hard to be productive sometimes! Thank you!